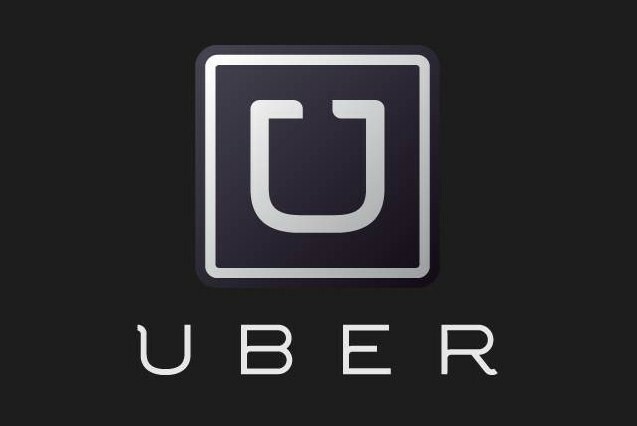 While driver and rider matching service Uber continues to operate in London pending its appeal against Transport for London declining to renew its operator’s licence, information comes to hand showing that TfL knew there were problems with Uber and Private Hire regulations in early 2014. 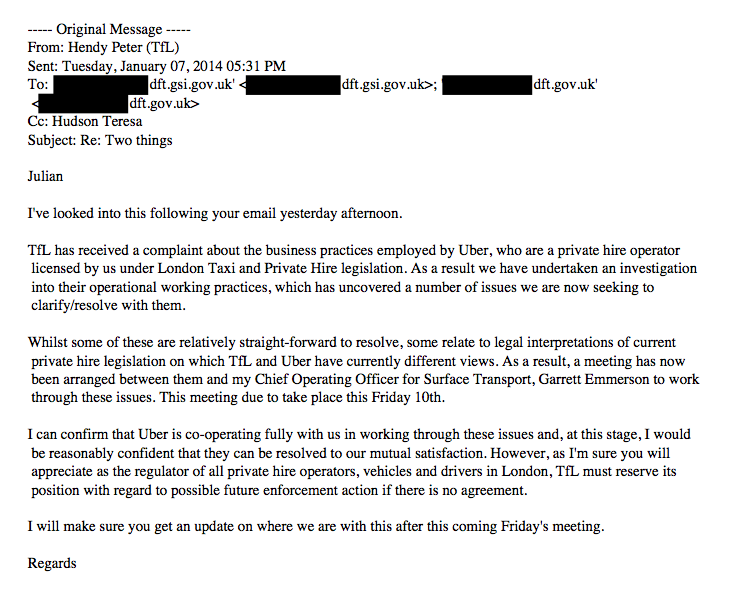 It also shows that Uber were deliberately bypassing TfL and lobbying the Government and its agencies directly. What went on in late 2013 to provoke the events which are covered in this post was serious enough for Uber in California to press the panic button. 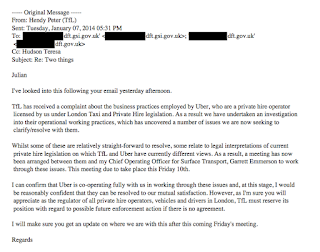 How serious can be seen from an email sent by Cliff Llewellyn of TfL to Jo Bertram of Uber in London. 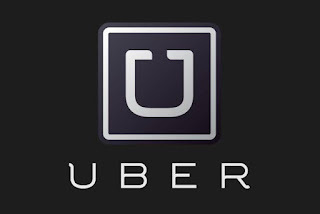 It stated unequivocally that Uber, as it was then operating, was breaking the law. He listed “areas that requires [sic] your urgent attention and response to me”. 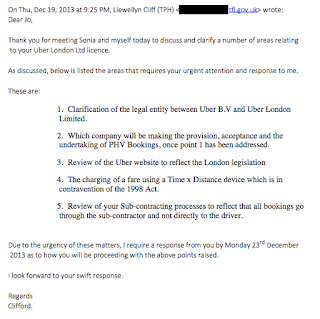 These included “Clarification of the legal entity between Uber BV and Uber London Limited”, “Which company will be making the provision, acceptance and the undertaking of PHV bookings, once point 1 has been addressed”, and “Review of the Uber website to reflect the London legislation”. Then came the real eye-opener. “The charging of a fare using a Time x Distance device which is in contravention of the 1998 Act”. That’s the “Smartphone = Taximeter” one. Stated by TfL. And, just to round off, came “Review of your sub-contracting processes to reflect that all bookings go through the sub-contractor and not directly to the driver”. 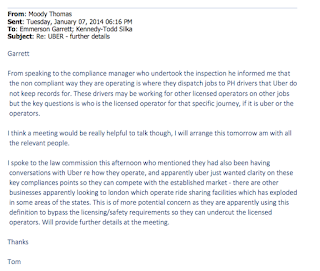 Llewellyn was playing it straight down the line, and pointing out exactly where Uber was not complying with the law. 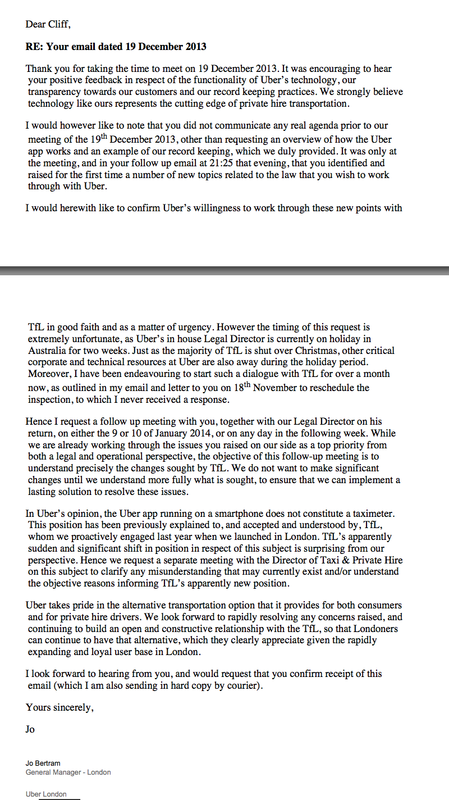 For this, Jo Bertram of Uber sent him a reply which, more or less, complained that it wasn’t fair. What also happened was that the next significant intervention came from a Foreign Office outpost in San Francisco. Samantha Evans, a Vice Consul at UK Trade and Investment there, contacted Daniel Korski, whose intervention I noted earlier. Here’s what she said. 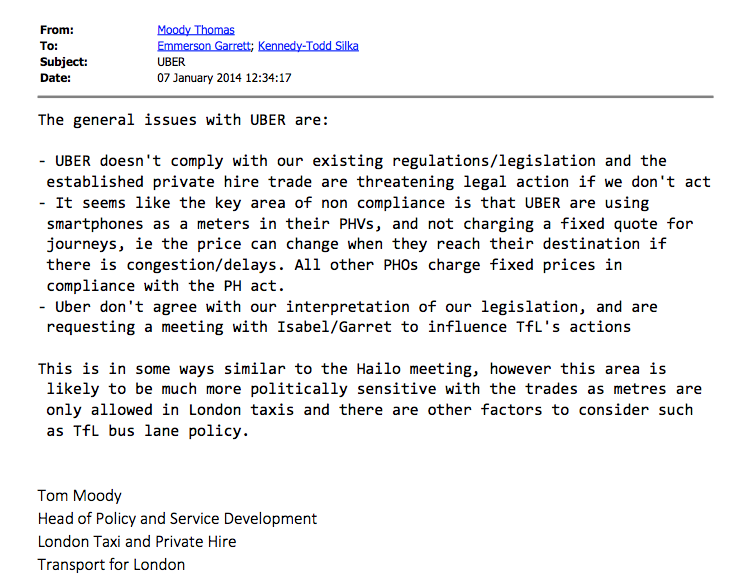 “You can see the email below from Corey Owens (Head of Global Public Policy at Uber) that they have been contacted by TfL and been threatened to have their license to operate in London revoked. 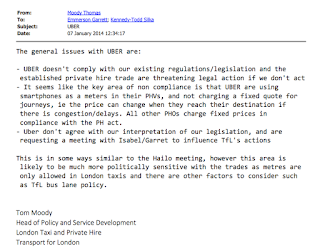 Specifically, they’re asserted [sic] that the iPhone is a taximeter, and non-taxi services can’t use a taximeter … Corey is flying to London this week to talk to TfL’s COO but has told us they have been told repeatedly by TfL compliance staff that 1) the pressure is coming from ‘the trades’ and 2) that these decisions are being made at TfL ‘above their pay grade’”. And then came something yet more interesting. So now Uber was trying to circumvent TfL by going to the FCO, who then went directly to Korski in Downing Street. Have a think about that. 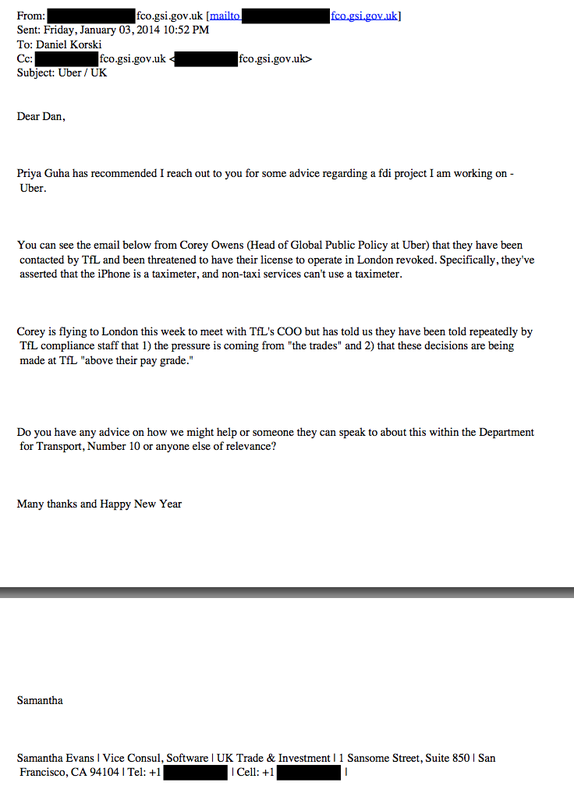 Very soon after Ms Evans made her intervention, Peter Hendy of TfL (yes, it had been escalated there too) was replying to Julian Glover of the DfT, which was also now involved, reassuring him that Uber were continuing to operate, and that problems were being worked through. 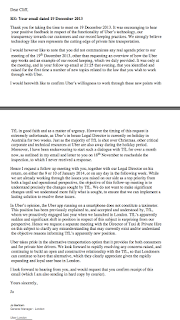 But he stressed that “we have undertaken an investigation into their working practices”, and that “Whilst some of these [problems] are relatively straight-forward to resolve, some relate to legal interpretations of current private hire legislation on which TfL and Uber have currently different views”. 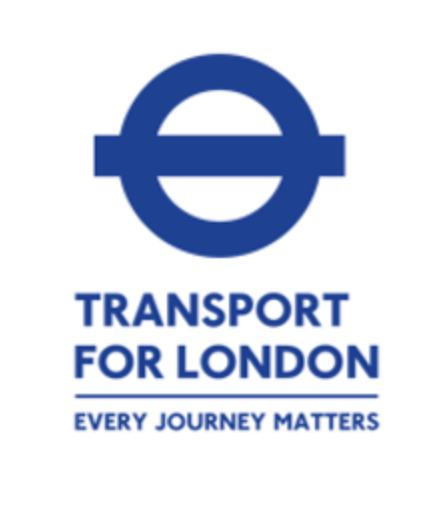 And while expressing confidence that the problems can be worked through, he adds “as regulator of all private hire operators, vehicles and drivers in London, TfL must reserve its position with regard to possible future enforcement action”. The seriousness with which Uber regarded this was reflected in the presence at the meeting the following Friday (January 10, 2014) of Travis Kalanick, then Uber head man. 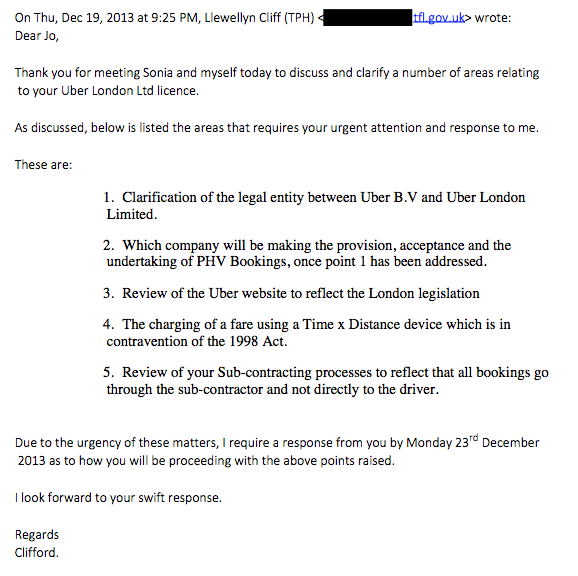 The deadline given to Uber by Cliff Llewellyn, which was December 23, appears for some reason to have gone by the board (Zelo Street has a copy of his detailed report, which concludes “If they fail to comply within a reasonable time period, then enforcement action is the only option”). 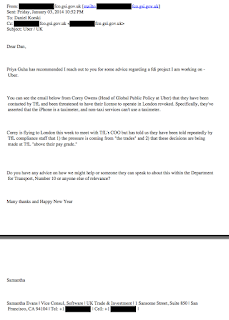 As can be seen from an email from Tom Moody at TfL to Garrett Emmerson, it had been made clear to TfL’s senior management that there were non-compliance issues. What happened in that Friday meeting is not known, but by January 14, Priya [surname redacted] at the FCO was telling “Thanks for following up on this issue and great to know we’re all on the same page in terms of identifying a solution that works for everyone”. 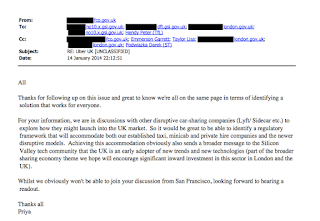 Which was good news for the FCO, because “we are in discussions with other disruptive car-sharing companies” and that “it would be great to identify a regulatory framework that will accommodate both our established taxi, minicab and private hire companies and the newer disruptive models”. This somehow ignores that inconvenient fact that there was already a regulatory framework in place, and gives the impression that some bending of the rules and looking the other way might be in order. Priya then concludes by asserting “Achieving this accommodation obviously sends a broader message to the Silicon Valley tech community that the UK is an early adapter of new trends and new technologies (part of the broader sharing economy theme we hope will encourage significant inward investment in this sector in London and the UK)”. What happened to Cliff Llewellyn’s tasking of Uber to put its house in order? Simples. They just by-passed him, went to the FCO, who went to Downing Street, who roped in the DfT, who appear to have put the arm on TfL’s top brass to let Uber carry on anyway. 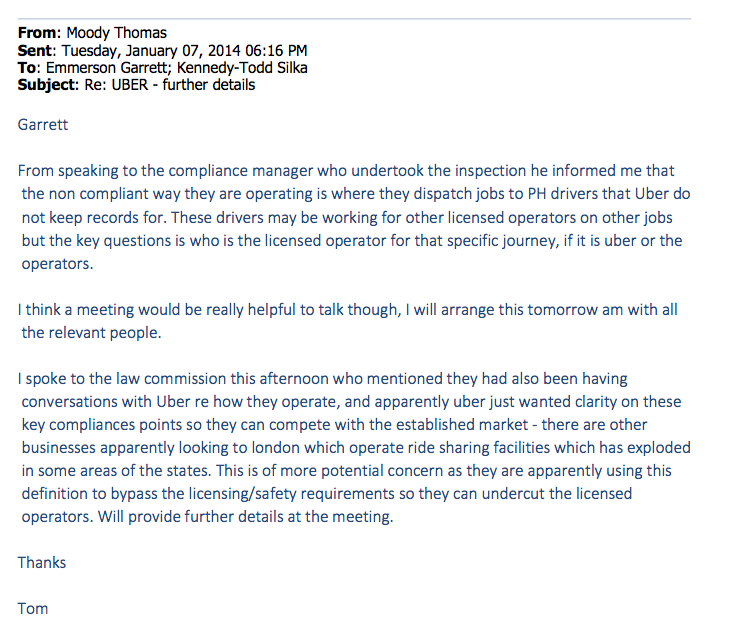 So there you have it: TfL knew, and spelt out in some detail, that Uber was an illegal operation in December 2013. Then, after lots of high level meetings, and the intervention of Travis Kalanick, along with representatives from Downing Street, it wasn’t. I hate to use words like corruption, illegality and rule breaking, but there we are. As the fictional US cop once said, what we have here is a total lack of respect for the law. If true, if illegal, doesn't this make someone or other an accessory before the fact? Corruption, anyone without connections to the Tories would have been put out of business. It stinks to high heaven.. It seems those in the Higher echelons at TFL started wetting their pants at the thought of being part of the " Tech Disruptive Society" as though "They, they" had split the atom!! OK, so what happens now? Do we have anyone chasing this up? Surely, something can be and must be done? Julia Hartley Dooda - Brexit Bias Much?